No. 27-ranked Aaron Ness was scrutinized closely by scouts at the Combine. It has been three years since public school hockey in Minnesota was considered a vital building block for more than one professional team at the NHL Entry Draft. In fact, in 2005 at The Westin in Ottawa, three public high school players from Minnesota were chosen in the first round – Brian Lee of Moorhead High (to Ottawa, ninth overall), T.J. Oshie of Warroad (to St. Louis, 24th overall) and Matt Niskanen of Virginia (to Dallas, 28th overall). But in the last two seasons, just one public school player was tabbed in the first round – David Fischer of Apple Valley (to Montreal, 20th overall) in 2006. With the 2008 NHL Entry Draft returning to Ottawa on June 20-21, it wouldn't come as a shock to hear the names of two high-profile public-school players from the North Star State taken in the first round at Scotiabank Place. 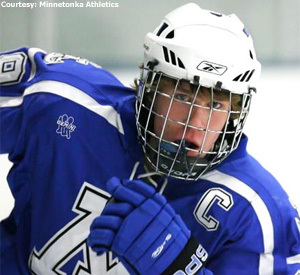 Minnetonka's Jake Gardiner, ranked No. 23 among North American skaters by NHL Central Scouting, and No. 27-ranked Aaron Ness of Roseau are two defensemen who received plenty of attention during the NHL Scouting Combine in Toronto last month. “High school kids are always risky,” noted one western U.S. high school scout. “But then again, any young player taken in the draft is a risky proposition. The stigma is these teams would rather draft a major-junior or college player than take a chance on a high school kid. But the upside is tremendous when dealing with high school players." Atlanta Thrashers General Manager Don Waddell likes to know the developmental plan of a high school player. "I like to know how he sees himself – is he a four-year student or is he hoping to play one more year and turn pro," Waddell told NHL.com. "It's rare to get a guy that will say he'd like to stay four years but, honestly, I'm a big believer in having the players stay longer in college unless they are really ready. I think the development, whether it's in juniors or college, helps these kids mature – not only as players, but more importantly as people. This way, when they come out at 21 or 22 years old, they are ready to take that next step." Ness earned Minnesota's prestigious Mr. Hockey Award as the outstanding senior ice hockey player this past season, beating out Gardiner, No. 36 Cory Fienhage of Eastview High and No. 54 Justin Jokinen of Cloquet. Ness, the Associated Press State Player of the Year, started on the varsity as a freshman under the tutelage of coach Scott Oliver. As a sophomore, he contributed 13 goals and 38 assists, and led the Rams (29-2) to their seventh Class AA state championship. This past season, he recorded career highs in goals (28), assists (44) and plus-minus (plus-67) to assist Roseau (29-2) to a fourth-place showing in the state tournament. In 88 high school games, Ness had 44 goals, 100 assists and was an astounding plus-133. Despite his size (5-foot-10, 157 pounds), Oliver feels Ness will become a solid professional. No. 23-ranked Jake Gardiner represented Team USA at the 2007 Under-18 Memorial of Ivan Hlinka Tournament in Slovakia and the Czech Republic. "His hand speed, stick skills and explosiveness are what set him apart from the other guy," Oliver said. "He won't move that guy in front, but he's going to be able to defend his stick by using his hand strength and smarts. He already has a tremendous work ethic on and off the ice and that's half the battle." Ness never has considered his stature a detriment. "I've always been a real gritty guy, so I'll go up against the 6-4 guy if I have to in the corner and love every minute of it," Ness told NHL.com. "With the way the game has changed, I feel my size will only benefit me in the long run." Gardiner (6-foot, 173) is regarded as an exceptional puck-moving defenseman and even played forward for much of his career before making the transition to the blue line as a senior. He certainly opened plenty of eyes in his new defensive role, including those of Minnetonka coach Brian Urick. "It was like he'd been playing the blue line his whole life," Urick said. "I think what impressed me most was how well he performed in one-on-one situations without the puck. Playing without the puck as a defender is pretty difficult, but he was so smooth. His reach is long, so that poke check became such a valuable asset." Gardiner will attend the University of Wisconsin in September after totaling 20 goals, 48 points and a plus-41 rating in his final high school season. He also represented Team USA at the 2007 Under-18 Ivan Hlinka Memorial Tournament in Slovakia and the Czech Republic. "Jake is the fastest high school player I've seen in my seven years as a coach with the program (including six as assistant)," Urick said. "He led more by example and was the hardest-working kid in practice every day. He has the makeup to be a very successful professional. Our high school has never seen a graduate stick in the NHL, but Jake has that potential." "Jake is a phenomenal skater with a lot of poise and patience. He's probably as good as any skater available in the draft," said one western U.S. scout. Defenseman Fienhage (6-2, 190) and Jokinen (6-2, 165), the lone forward of the group, are two other performers who could go as high as the second round. Fienhage, who likely will attend the University of North Dakota in the fall, joined the Indiana Ice of the United States Hockey League after the high school season ended and posted three points and was a plus-5 in 12 games. "Cory loves the physical game, is a strong skater and has great feet and balance," said Eastview coach Drey Bradley. "He was the top defenseman in our conference and the strongest in the defensive zone, especially the corners. He makes good decisions with the puck." Jokinen, who helped Cloquet (15-13-2) to the state Class AA tournament for only the second time in 15 years in 2006-07, registered 22 goals and 50 points as a junior and posted 21 goals and 43 points this past season while logging an average of 25 minutes of ice time a game. He'll attend Minnesota State University-Mankato in September. "I'm a stickler for playing positional hockey, and Justin played his position as well as anyone I have ever coached," Cloquet coach David Esse told NHL.com. "That enabled him to find any open area on the ice. He was an all-around player that could use the body when necessary and create space down the middle." Central Scouting has rated 13 public-school skaters from Minnesota among its top 200 on the North American list, including six defensemen.